Well-written paragraphs may suspend the main point for drama and end in a contrary thought for surprise. But these stylistic tricks are not advisable in business writing. Here are before and after examples showing why plain language begins with hitting the high note at the top of the paragraph. Our firm has trained over 10,000 corporate and government employees in project management skills. We have assisted more than 100 companies with some 600 events and projects through planning, coordination, facilitation, and coaching by the most highly rated, credentialed, and experienced consultants in the profession. In essence, we have connected businesses with their clients through a disciplined approach to continuous improvement, saving our clients millions of dollars by efficiently deploying human, capital, and real resources. Draft 1 needs some work. Even though its sentences are clear, they it focuses on the firm and not its clients. In effect, the most important point from the key reader's perspective, namely, how the reader will benefit from employing the firm, is buried under meaningless data. Draft 2 shows a more effective way to transmit the same information for greater reader interest and retention. Our firm has saved clients millions of dollars by efficiently deploying human, capital, and real resources by connecting businesses with their clients through a disciplined approach to continuous improvement. We have trained over 10,000 corporate and government employees in project management skills, and we have assisted more than 100 companies with some 600 events and projects through planning, coordination, facilitation, and coaching. Our consultants are the most highly rated, credentialed, and experienced in the profession. Before choosing sentence structure and vocabulary, we should decide what is the most important information for our readers—and start there. Plain language is here to stay. Philosophers and rhetoricians have studied plain language for centuries. Industry and government have tried with varying degrees of success to enact plain language initiatives since at least the early 1970s. 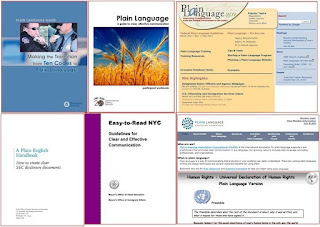 Since plain language is an initiative on federal and local levels of the United States, and because government agencies have been asking me to design plain language instructional programs for their staff, I will devote numerous posts to plain language tips. BOOK REVIEW: "Bird by Bird: Some Instructions on Writing and Life"
I read Anne Lamott's Bird by Bird: Some Instructions on Writing and Life years ago, around the time of its 1995 publication, so this belated mini-review—actually, more a reflection—comes as a nod to the author for the lessons learned, not from her writing instructions or her life instructions, but from her writing life instructions. Lamott might have entered the writing business with a fragile ego, as one editor after another red-inked her manuscripts or made intolerant remarks about her style. But she undoubtedly has the right stuff to share her insights from those inevitable situations regardless of the writer's mastery over content and style. If these moments do not toughen your writing skin, as they have Lamott's, you should consider another profession. This post, the 664th of WORDS ON THE LINE, marks the eleventh anniversary of the blog. To celebrate it, I want express my indebtedness to my many clients who have entrusted me to design their courses, train their staff, evaluate their messages, and write or edit their documents. Throughout my adult life, I have been an amateur philosopher, meaning I read heavy philosophy lightly, trying to capture glimmers of insight and sparks of inspiration as springboards for sharpening my own intellect and as means for cultivating my writing. This list includes some of my favorite philosophy. Mortimer Adler, the philosopher of the Golden Age of television. Hannah Arendt, who has a knack for connecting philosophy to everything in human experience. Aristotle, especially his Rhetoric and Ethics. Albert Camus, one of the most understandable existentialists. Rene Descartes, whose discourse was a game changer. Martin Heiddeger, whose Dasein advances existential theory. Thomas Hobbes, whose clear, practical interpretation of human nature and government still resonate in these troubled times. Eric Hoffer, the most accessible, down-to-earth philosopher I know. William James, whose pragmatics and psychology put America in the book of great philosophers. Immanuel Kant, the creator of the categorical imperative. Soren Keirkegaard, most notably Fear and Trembling. John Locke, whom many libertarians credit for their political viewpoint. Friedrich Nietzsche, whose brilliance extends far beyond Übermensch. Plato, whose cave analogy in The Republic is a ground breaker. Jean-Jacques Rousseau, whose Social Contract and Emile are must-reads. Bertrand Russell, if for nothing else, for his history of Western philosophy. Jean-Paul Sartre, in particular Existentialism and Human Emotion.